To totally customise it, I would want to change the rug on the floor - it needs to be much bigger, and more luxurious. Then add a huge squashy couch with lots of cushions and a mohair rug, for curling up and reading on a chilly day. A few side tables for the current reading list... A couple of armchairs for visiting readers. Oh, and lamps - I love lamps. Although, the lighting on the bookshelves themselves is pretty cool. I love that there is natural light from those wonderful windows - without sacrificing too much book space. 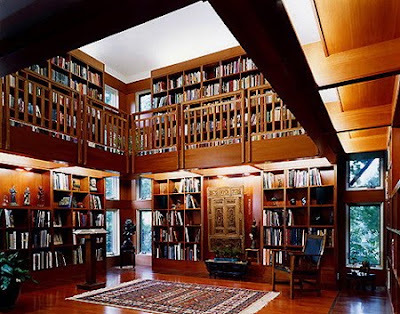 And I just lust after the whole mezzanine, grown up library second level thing - hopefully there's a funky circular staircase to get up there.